Over the last four years I have regularly taken part in track sessions at Mile End Stadium on Tuesday nights. The sessions led by Peter McHugh (Run-Fast coach/The Running Works owner) have played a major part in knocking 10+ minutes off my half and full marathon personal bests. I know that if I can make it to track for 5-6 weeks in a row I will get into good shape. Knowing there is a large group of runners putting in the hard work together inspires me and helps me when the weather is challenging. The sessions vary week by week but generally consist of some shorter and longer repetitions totalling between 8 and 10k of effort with 60-70 seconds of recovery between reps. Similar sessions each week and regular time trials help you to stay motivated and monitor progress. If you are aiming for certain goals and want to get quicker, attending regular track sessions is the most efficient way of improving fitness and pushing out of your comfort zone. 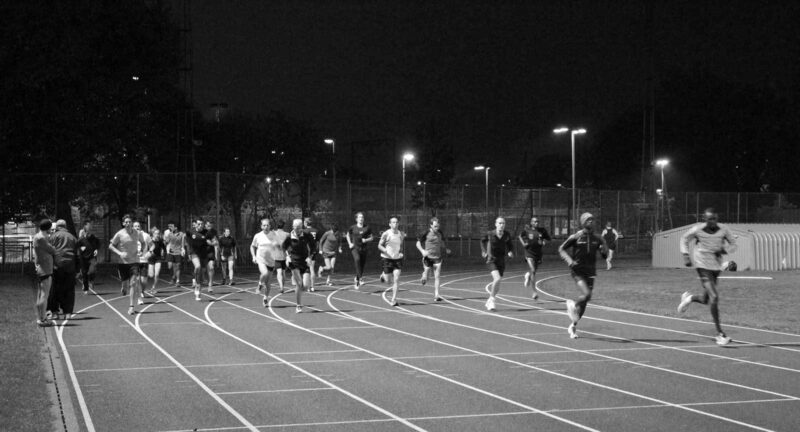 If you are nearby and you fancy joining us for a track session, just turn up on Tuesday nights at Mile End Stadium at 7:30pm. See Full details of track and other run club sessions here.